No, it?s not another one of those columns. Seventy-five years ago yesterday, a 26 year-old black man, thin as a rail and wearing a dark suit and hat in the sweltering June heat, walked up to the Vitagraph Building in Dallas, Texas. With him, he carried a road-worn guitar in a road-worn guitar case and a worried mind. The third floor of that three-story art deco building at 508 Park Avenue in Dallas – owned by Warner Brothers – housed Brunswick Records, the young man's destination. As he lugged his guitar up the stairs, that feeling of inevitable, impending tragedy rose up once again. It never left his mind; really, it merely ebbed and flowed, as perpetual and persistent as the tides and time itself. Once inside the makeshift recording studio, he sat down, enveloped in the musty, stagnant, stifling summer heat and opened his guitar case. That feeling, that foreboding sense of doom, made it hard to concentrate sometimes, but it wasn't the recording session that was making him feel uneasy. He was a walking musician. A steady rollin' man. An experienced itinerant busker. He played whatever and wherever, for whatever he could earn. He played pop. He played jazz. He played country. He played Mississippi. He played Arkansas. He played Illinois. He played for cash. He played for booze. He played for board. And he had done this before – this newfangled "recording" thing – in November of 1936, in Room 414 of dusty old San Antonio's Gunter Hotel, another of Brunswick's ersatz recording studios. His mind never stopped thinking about that night; indeed, it never could – even his unquestioned mastery of the guitar brought him no solace, for that very proficiency rang and buzzed and squealed and howled as a constant aural reminder of what he had bought, and the price yet to be paid. 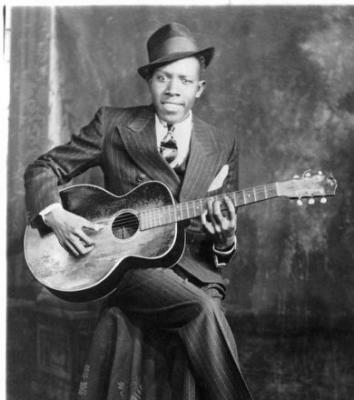 No, it was not performance anxiety that gave Robert Leroy Johnson such a worried mind. It was the deal he struck with the Devil. Prior to becoming the black American Faust, Johnson probably could be described best as a "wannabe." He had a burning desire to become a renowned musician, and was willing to do anything to achieve his desire – a dangerous combination. However, while his harmonica playing was tolerable good, his guitar playing was unlistenably bad. Then came that fateful midnight at a rural crossroads near Dockery Plantation, outside Ruleville, Mississippi. Johnson met the Devil in the form of a large black man, who took his guitar from him, played a few tunes, and handed it back. From that moment on, the deal was sealed – less than two years later, Johnson re-emerged with a heretofore unknown mastery of the guitar and a peculiar brand of microtonal vocalizations that would establish him as the font from which all modern American music would flow. Material success would elude Johnson during his lifetime. He didn't make much money from the recordings, and he continued on as a wandering Griot until the day he could no longer dodge the stones in his pathway, and the hellhounds on his trail began biting at his ankles. He suffered a miserable, agonizing death while convulsing in sheer, mind-erasing pain for days, just one year after the Dallas sessions. Apparently, he was poisoned by the jealous husband of a woman he'd been seeing. And what of the price he had to pay? Was it his lack of recognition during his lifetime? Was it his agonizing death? Did the devil collect his soul? Like any true Faustian bargain, there's a twist at the end. Johnson played his part and then left the stage, his account paid in full. His worried mind, his fear of an inevitable, impending tragedy, his foreboding sense of doom was not for his own soul, but for ours. You see, in the end, the Devil got his due; the Devil, Satan, Iblis, Ba'al Zebab – however you may call him – gave the world one of the greatest artists it would ever know…and here we sit,75 years later, listening to Justin Bieber and Lady Gaga.